Based on the findings and analyses in the previous chapters, this chapter suggests some key areas around which the Integrative SDG Governance (ISG) framework could be developed. 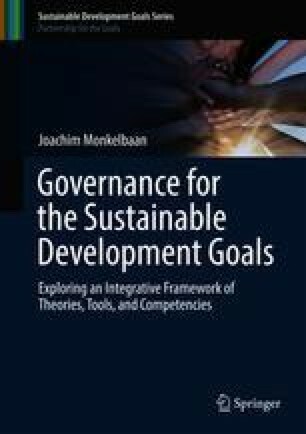 This is in line with the question ‘Which theoretical pillars (cross-cutting themes) and competences can be drawn from existing literature and the case studies together on the areas in which Integrative SDG Governance should be more encompassing than extant sustainability governance?’ The indicator areas or ‘frames’ are grouped around the three pillars of power, knowledge and norms because the literature review, interviews and case studies together show the importance of (the interplay between) these themes as ultimate drivers for sustainability governance (Conventional strategies for sustainable development operate on the ‘proximate drivers’ of governance, namely technology, demographics and institutions. These proximate drivers are mainly responsive to short-term intervention. The ultimate drivers for sustainable development are power, knowledge, norms and culture (Raskin et al. 2002). These drivers are subject to long-term systemic processes.). However, there is not much research available on sustainability governance that looks into the role of all three of these theoretical pillars. Still, much of the existing literature on power, knowledge and norms is problematic in the context of interdisciplinary and transdisciplinary research fields (such as sustainability science) and tends to reach high levels of abstraction and terminological subtleties.